Review Nokia followed up its first 8GB mobile, the music-centric N91, with a second one, the N95 8GB. And now here's a third: the music and gaming geared N81 8GB. The N81 arrives at the same time as its more luxuriantly-equipped N95 stablemate, bringing a smidgen more choice at a lower price to the high-capacity music-mobile arena. Nokia is, unsurprisingly, focusing on the N81’s music capabilities. As well as its headline storage capacity, and obligatory dedicated music controls, the N81 8GB is one of the first mobiles to support Nokia's Music Store over-the-air download service. This handset is also one of the first geared up to handle Nokia’s revamped N-Gage mobile gaming platform, with a mix of dedicated keys and front-panel buttons that double up as console-style controls. 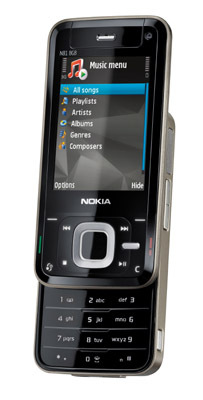 The N81 is based on the Symbian 9.2 operating system, with Nokia's own S60 3.1 user interface. It’s a quad-band GSM and 3G device, although HSDPA isn’t included. Nokia has added 802.11b/g Wi-Fi, however, so users have the option of selecting this cost-effective and convenient route for downloading and surfing. The N81 offers a more modest feature set than the N95: an average two-megapixel camera with flash sits on the back, and there’s no GPS receiver in this model. There’s also a more straightforward, one-way slider mechanism on this device, with music player controls arranged around the central navigation keypad rather than under a separate cover. Still, the N81 is some pocketful for a sliderphone, weighing in at around 140g and measuring a less-than-slimline 102 x 50 x 17.9mm. The back and front are made from glossy plastic, which feels a little cheap, and was slippery in hand - particularly when paws were cold or wet. Dominating the front panel is large, bright 2.4in, 320 x 240, 16.7m-colour display.